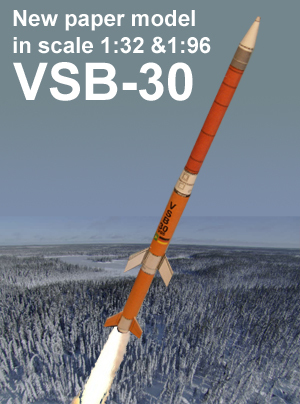 At this site you can download free paper models of rockets and spacecrafts. You will find the models in the models section. To print the models you will need Adobe's Acrobat Reader - it is free. All the models are for free for your own personal use. If you want to share the models on your own website – please read this. Most of the models are designed by me, but I can also present contributions from Joy Cohn, Eric Truax, Lee Fleischer, Lancer, Jean Paul, Mark Lardas and Xosema. I will also like to mention Lars Folmann from Classic Paper Space Models, who inspired me to draw my own models.